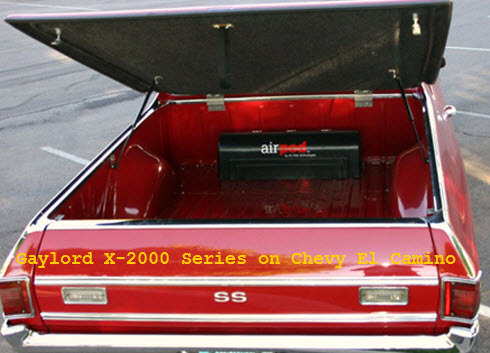 Gaylord Tonneau Covers have over 55 years of engineering experience behind them. Gaylord Tonneau Covers or Gaylords Truck Bed Lids as they prefer to be referred to, manufacture a line of three basic resin filled, honeycombed, hard fiberglass tonneau covers. 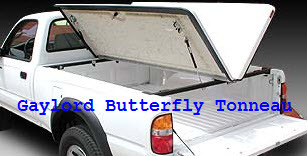 Two of Gaylords “lids” , the Traditional and the X-2000 are hinged at the front of the truck bed while the Butterfly Lid is hinged down the center of truck bed. All models are lockable, weather resistant, have a wrap around rail design so they look OEM, have built in stainless steel cross bar hinges for strength and heavy duty gas struts to make that whole open and close procedure smooth. You can request a trimless lid and almost perfectly match your pickups paint color if you send them the factory color code. You can get some cool options like charcoal color carpeting on the underside of the lid. Looks to me like 55 years in the business has given Gaylords some great products and ideas. Using a tonneau may have some adverse side effects for your truck bed. The tonneau slows the rate at which your truck bed dries as it seals of the area. I'm using several universal absorbent truck mats to help reduce water, gas and other liquids on my truck bed. I also use them on top of my rubber floor mats in the cab. That way my boots don't slosh around in the coffee or muddy water that's typically loitering on the top of my rubber mats.